Just as our minds are inattentive when we set out to pray, so too we proceed to do so with an equally careless and sprawling deportment of our bodies. True, we pretend that the worship of God is our reason for wearing better than everyday clothes on feast days, but the negligence with which most of us pray makes it utterly clear that we have utterly failed to conceal the real motive, namely a haughty desire to show off in the eyes of the world. Thus in our negligence we sometimes stroll around, sometimes sit down on a stool. And even when we kneel down, we either place our weight on one knee, raising up the other and resting it on our foot, or we place a cushion under our knees, and sometimes (if we are especially spoiled) we even support our elbows on a cushion, looking for all the world like a propped up house that is threatening to tumble down. And then our actions too, in how many ways do they betray that our minds are wandering miles away? We scratch our heads, clean our fingernails with a pocketknife, pick our noses with our fingers, meanwhile making the wrong responses. Having no idea what we have already said and what we have not said, we make a wild guess as to what remains to be said. Are we not ashamed to pray in such a deranged state of mind and body -- to beseech God's favor in a matter so crucial for us, to beg His forgiveness for so many monstrous misdeeds, to ask Him to save us from eternal punishment? -- so that even if we had not sinned before, we would still deserve tenfold eternal torments for having approached the majesty of God in such a contemptuous fashion. Imagine, if you will, that you have committed a crime of high treason against some mortal prince or other who has your life in his hands but who is so merciful that he is prepared to temper his wrath because of your repentance and humble supplication, and to commute the death sentence into a monetary fine or even to suspend it completely if you give convincing signs of great shame and sorrow. Now, when you have been brought into the presence of the prince, go ahead and speak to him carelessly, casually, without the least concern. While he stays in one place and listens attentively, stroll around here and there as you run through your plea. 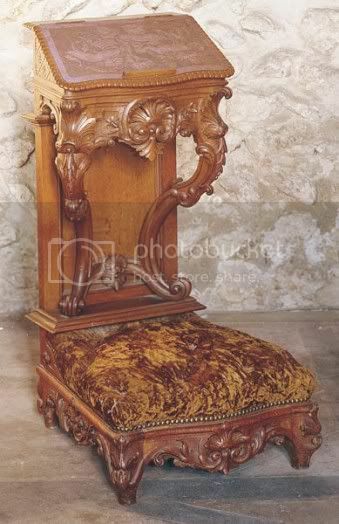 Then, when you have had enough of walking up and down, sit down on a chair, or if courtesy seems to require that you condescend to kneel down, first command someone to come and place a cushion beneath your knees, or, better yet, to bring a prie-dieu with another cushion to lean your elbows on. Then yawn, stretch, sneeze, spit without giving it a thought, and belch up the fumes of your gluttony. In short, conduct yourself in such a way that he can clearly see from your face, your voice, your gestures, and your whole bodily deportment that while you are addressing him you are thinking about something else. Tellm e now, what success could you hope for from such a plea as this? Certainly we would consider it quite mad to defend ourselves in this way before a mortal prince against a charge that carries the death penalty. And yet such a prince, once he had destroyed our bodies, could do nothing further. And do we think it is reasonable, when we have been caught committing a whole series of far more serious crimes, to beg pardon so contemptuously from the king of all kings, God Himself, who, when He has destroyed our bodies, has the power to send both body and soul together to hell? Still, I would not wish anyone to construe what I have said as meaning that I forbid anyone to pray while walking or sitting or even lying down. Indeed I wish that, whatever our bodies may be doing, we would at the same time constantly lift up our minds to God (which is the most acceptable form of prayer). For no matter where we may turn our steps, as long as our minds are directed to God, we clearly do not turn away from Him who is present everywhere.... but... besides such prayers for which we prepare our minds more thoughtfully, for which we dispose our bodies more reverently, than we would if we were about to approach all the kings in the whole world sitting together in one place. Yes, you totally do :-D.